Crestware CS Stainless Steel Cake Stand 13"
TigerChef > Browse by Store Type > Bakery Shop > Bakery Displays >< Cake Stands and Covers > Crestware CS Stainless Steel Cake Stand 13"
✔ Professional grade✔ Dimensions: 13"
$7.90 Winco CKS-13 Round Stainless Steel Cake Stand 13"
$6.66 Winco CKS-13C Round Acrylic Cake Stand Cover 12"
$16.99 Winco CKS-13CS Round Stainless Steel Cake Stand and Lid 13"
$9.09 Thunder Group SLCS001 Cake Stand 13-1/4"
$34.99 Crestware RCS Revolving Cake Stand 13-1/4"
$140.99 10 Strawberry Street WTR-8CAKESTND Whittier Cake Stand with Foot 8"
$77.99 10 Strawberry Street WTR-10CAKESTND Whittier Cake Stand with Foot 10"
$72.99 Focus Foodservice 90RCS12 Revolving Cake Stand 12" Dia. $7.69 Crestware ACC12 Acrylic Cake Pan Cover 12"
Showcase delicious cakes with the Crestware CS Stainless Steel Cake Stand 13". This attractive cake stand boasts an elegant look that will highlight your dessert and look great as part of a variety of settings. Constructed from stainless steel, this cake stand is rust and corrosion resistant and exceptionally strong to withstand years of high volume use. An excellent option for high volume environments, this cake stand is easy to clean and ideal for restaurants, catering companies and other food service facilities. 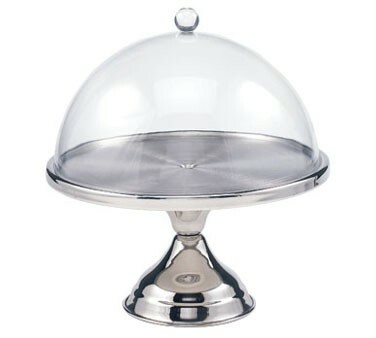 Does it come with lid or how can I order lid for this cake stand? The lid for this cake stand is Crestware Item #ACC12. It is sold separately.